Dr.L.Nirmala Devi obtained her bachelor of Engineering(B.E) in Electronics and Communication Engineering from Osmania University, Hyderabad, Andhra Pradesh, India and her Master of Engineering (M.E) with Specialization in Systems and Signal Processing from Osmania University, Hyderabad, Andhra Pradesh, India and obtained Doctor of Philosophy (Ph.D) from Osmania University, Hyderabad, Andhra Pradesh, India in the Area of Optical networks under the faculty of Electronic and Communication Engineering. Dr.L.Nirmala Devi is a Life Member of Optical Society of India (OSI) and Member of Institute of Electrical and electronics engineers (IEEE),USA. 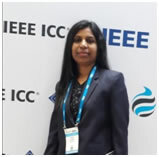 Her research interests include wireless networks, Mobile Adhoc networks mobile sensor networks, Digital signal processing and Radar signal Processing. Currently she is working on project titled "Security issues in mobile Adhoc and sensor networks" funded by Department of Science and Technology (DST) govt. of India for a duration of 4 years.